University of Nebraska students work on their spaceflight project in January 2018. Update for March 24: NASA has delayed the launch of the University Student Instrument Project on a small Terrier Improved Malemute sounding rocket to no earlier than Sunday, March 25, due to rough seas in the payload recovery zone. NASA's live webcast will begin at 6 a.m. EDT on Sunday. Student spaceflight projects will launch from NASA's Wallops Flight Facility in Virginia on Sunday morning (March 25), and the rocket carrying them might be visible along parts of the U.S. East Coast. The University Student Instrument Project (USIP) payload is the work of teams at the Florida Institute of Technology, the University of Kentucky, Utah State University and the University of Nebraska-Lincoln. In 2016, these schools were picked to explore projects "that may impact future spaceflight," Joyce Winterton, the senior adviser for education and leadership development at the Wallops Flight Facility on Wallops Island, Virginia, said in a statement about the upcoming launch. The NASA Visitor Center at Wallops will open at 5:30 a.m. EDT for public viewing. A sounding rocket is a spacecraft designed to take measurements and conduct experiments, and it spends a relatively short time in space. Launch viewing visibility map for the Undergraduate Student Instrument Program launch. Wallops is located in eastern Virginia, and people along the coast of the state and those as far north as Maryland are expected to be able to see the USIP launch. If you live farther away but want to catch this student project payload flying up into the sky, you can watch it online. In addition to the live webcast from Wallops, a Facebook Live broadcast will show the launch starting at 6:15 a.m. EDT (1015 GMT). Smartphone users can also download the "What's Up at Wallops" app, which features a compass that shows the direction you should face for launch viewing. According to NASA, the rocket will reach an altitude of about 100 miles (160 kilometers). The experiments will later descend by parachute and land in the Atlantic Ocean about 70 miles (110 km) from Wallops Island after the flight. The projects will then be recovered and returned to the students later that day. 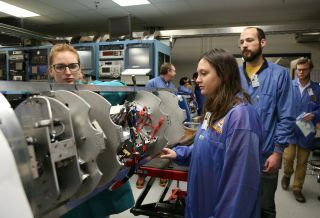 Students participating in the Undergraduate Student Instrument Project observe vibration testing of the payload. The ocean recovery plan caused a series of launch delays. The USIP flight was originally scheduled for Thursday morning (March 22) and was delayed to Friday, but officials postponed it to Saturday because of bad weather, and rough seas were expected to interfere with recovery efforts. Rough seas were also expected on Saturday, forcing a delay to Sunday. During the flight, students at the Florida Institute of Technology will test an insulation repair material in a near-vacuum environment, while students at the University of Kentucky will deploy a small entry spacecraft during the flight to test a communications-and-thermal-protection system design. Utah State University students will test a thruster system with green propellant while looking for any harmful effects of plume contamination, and students at the University of Nebraska will test a retractable boom and solar blanket for applications on small satellites as well as sounding rockets. Editor's note: If you capture an amazing image of the sounding rocket launch that you would like to share with Space.com and its news partners for a story or photo gallery, send photos and comments to spacephotos@space.com.